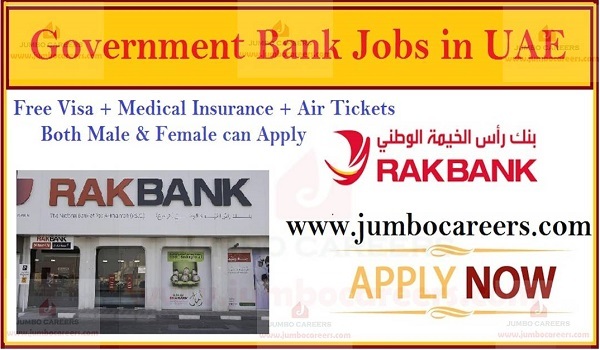 Ras Al Kahima Semi Government firm National Bank Of Ras Al Khaimah ( RAK BANK) Free recruitment in April 2019 for Dubai & Abu Dhabi. Its a free and direct recruitment by the company. About National Bank Of Ras Al Khaimah ( RAK BANK): RAK BANK is the trading name of the National Bank of Ras Al-Khaimah PJSC, a public joint stock company headquartered in the emirate of Ras Al-Khaimah, in the United Arab Emirates (UAE). The Bank is 52.76% owned by the Government of Ras-Al-Khaimah with shares that are publicly traded. The Board consists of several members of the ruling family of the emirate and businessmen from across the UAE and Kuwait.